Can a paradox be pleasing? Understanding why a paradox is a paradox can be pleasing. I find this M.C. Escher drawing pleasing. 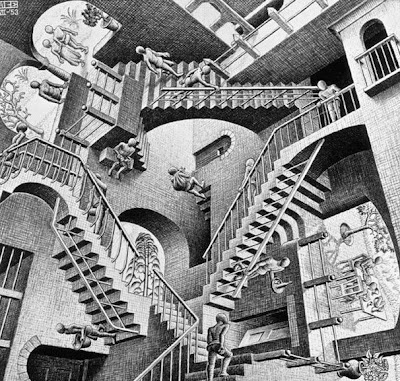 But honestly, if was a maid and was asked to clean the stairs, I’d quit (also I bet Escher didn't have doorbells to worry about). Escher was great at drawing the line. My background music has me blogging the line. I blog the line. Yes I’ll admit that I’m a fool for you. Because you are mine, I blog the line. 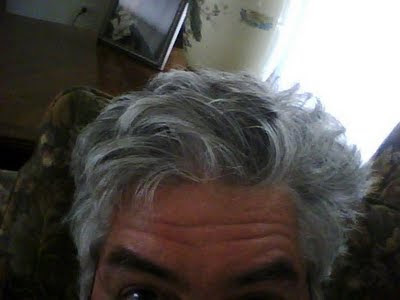 (BTW I have never had to walk the line for the police) I keep a close watch on this blog of mine. Tell me something good for a Tuesday. I would like to see an expansion of "I Blog the Line." I think AFCSOAC deserves an anthem! I got a pair of girls off on the bus this morning, one at 6:45. That looks so much worse than quarter to seven. No paradox in the rain. Are you still recording in your car? I could send you a verse but as you know I can't sing. Thanks for the Monday update. I don't think I'm creative enough to comment here! :) Thanks for visiting my blog though! Well it is Wednesday here now at 8.15am. The sun is shining and the birds are singing and I get to live another day. That is pretty good no? Do you know that Walk the Line is my favourite film of all time. Seen it over and over now. Great acting and I love Johnny Cash. Took a long time to appreciate him but I do now. And no I have never had to walk the line for the police either. Have a great Wednesday! I accept all comments except spam. Thanks for browsing by and letting me and others know. Something good for a Tuesday (or, quite frankly, any day of the week): wearing socks in two different colours is my style, And they are easier to sort. P.S. Nutjob or not, I love you, Joaquin. How 'bout something good for a Wed? The leaves are just beginning to turn in northern New England!. Yeah sure any day is fine. The coloring of the landscape is big attraction and New England gets to start it ever fall. The drought caused many trees here and more to the south of us to drop leaves in July. It was strange seeing leaves blowing around in the middle of summer. I saw a really cool traveling Escher exhibit a few years back. At an art museum? I have a book about his work but I was looking for when I wrote this and could not find it. Yes, it came to the museum here for a few weeks and we took the kids to see it.